I'm not dairy-free but that hasn't stopped me from lusting after So Delicious Dairy Free® frozen treats. I've long seen them and made a note to myself, "Hey...those look yummalicious. You should get them sometime." 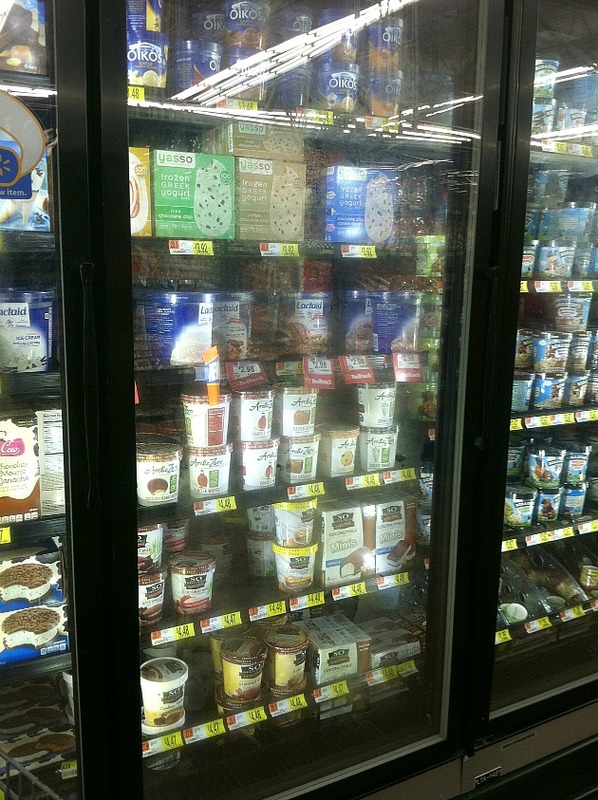 So when I had the opportunity to create a dairy-free recipe using So Delicious, I RAN to the frozen section of my closest Walmart! I was faced with a dizzying array of amazing options...but my heart was stolen when I laid eyes on their Cashew Salted Caramel Cluster and Cashew Dark Chocolate Truffle. Sweet and salty cashew milk based frozen dessert with chocolate covered cashews and ribbons of salted caramel? HEAVEN. Fair trade cocoa (also cashew milk based) frozen goodness folded with fudge and shaved chocolate? OMIGOSH YES. 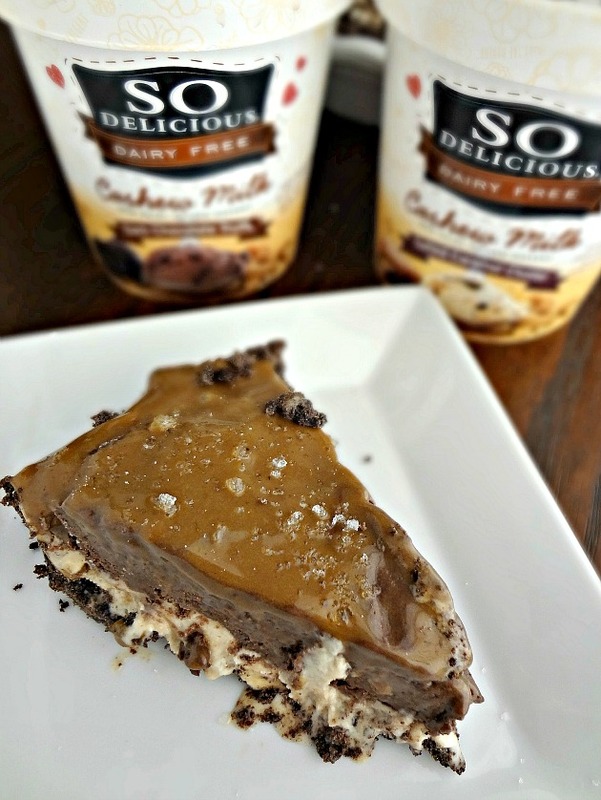 I decided the perfect way to highlight the 2 delectable pints of So Delicious Dairy Free® goodness that I picked up was in the form of a vegan (and, obviously, dairy-free) frozen pie! The base is a perfect, no-bake, chocolate cookie crust. Then there's a layer of the Cashew Salted Caramel Cluster, topped with a layer of Cashew Dark Chocolate Truffle. And the finishing touch? 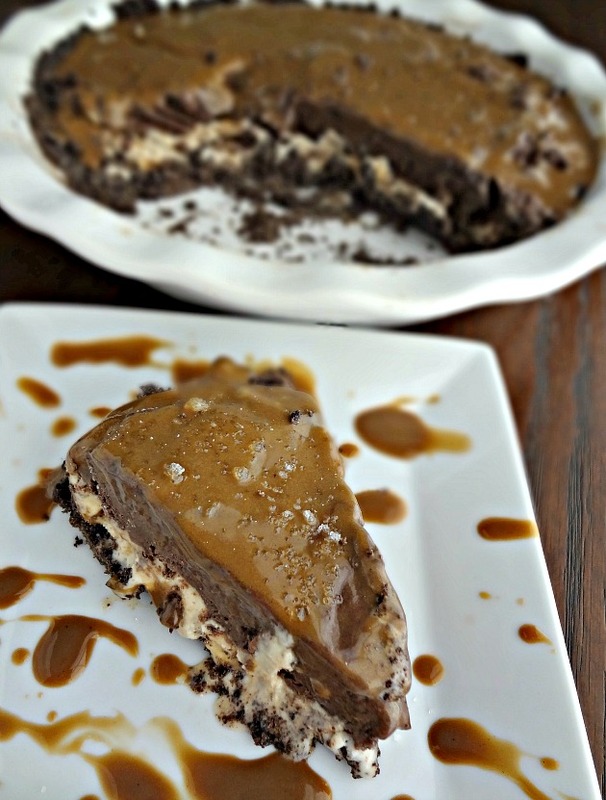 You cover the entire pie with vegan salted caramel sauce (which you are more than welcome to buy, but I have included a recipe below!) This pie is the perfect melding of flavors, everything balances so nicely and it all tastes deliiiicious together! 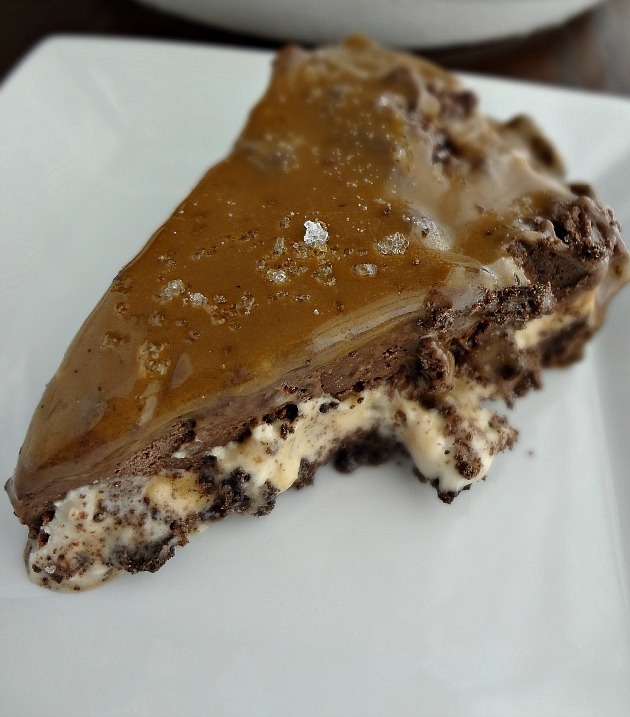 The alternating layers of chocolate and caramel. The crunchy crust, creamy frozen filling, and gooey caramel. The perfect marriage of salty and sweet. A dessert that can be enjoyed by practically everyone-vegan or not! Guys...this is a good one, you're going to LUHVE it. The name does not lie....it really is: SO DELICIOUS! Crust recipe adapted from Crazy for Crust and Caramel recipe adapted from Wonky Wonderful. Finely crush your cookies. I use a food processor for this, but you can also place the cookies in a plastic bag and roll the sealed bag with a rolling pin (leave about an inch open for air to escape in the sealed bag). Either way, make sure the cookies are very finely crushed. Stir the cookie crumbs and melted coconut oil together with a fork. Press crumbs into the bottom and up the sides of a 9" pie plate. Chill about 30 minutes before filling. In a large pot or saucepan, over medium heat, combine the sugar and coconut oil. Stir for 1-2 minutes until it turns a deep brown color and begins to melt-be careful not to burn. Add the coconut milk and vanilla extract and whisk vigorously for 25 minutes. Don't stop! Remove from heat, add salt, and continue to stir for 1 minute. Transfer to a clean glass jar and refrigerate until ready to use. Spread the softened salted caramel cluster evenly in the chilled pie crust. Place in the freezer for 15-30 minutes, until it looks set. Cover with a layer of the softened dark chocolate truffle. Freeze for 30 minutes. 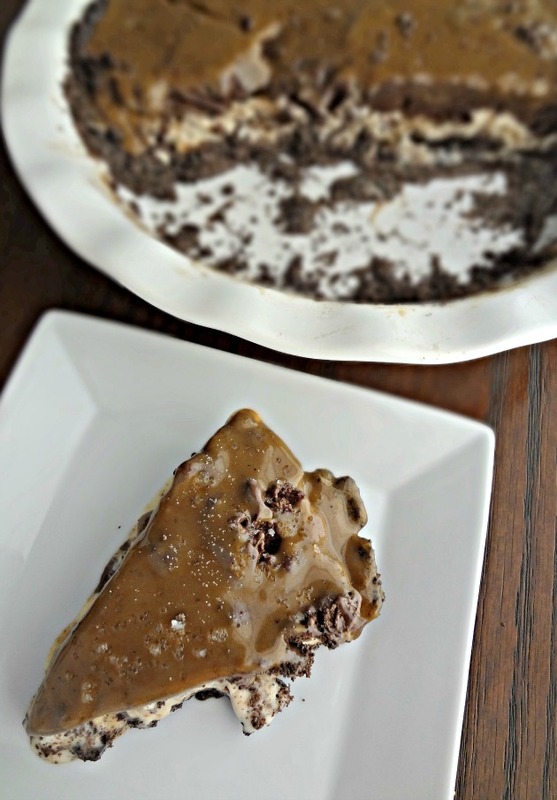 Drizzle an even layer of the vegan salted caramel over the frozen pie. Place in the freezer until the caramel becomes semi-solid, sprinkle with coarse sea salt, cut and serve! (You may need to let the pie sit for about 10 minutes to make cutting it easier). Make sure to check out more delicious, decadent, and DAIRY FREE inspiration using So Delicious!